Several Connecticut homeowners whose homes have been damaged because the foundations are crumbling are calling for a federal investigation into the problem. Many of the homeowners who live in northeastern Connecticut have gathered today at the federal building in Hartford and filed a formal complaint with the U.S. Attorney’s Office, asking for a federal investigation into the crumbling foundation crisis. State officials estimate around 30,000 homeowners affected by the problem. 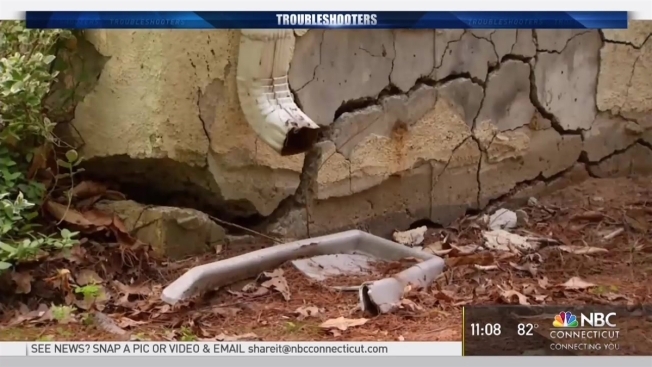 The NBC Connecticut Troubleshooters broke the story about the crumbling foundation crisis two years ago and thousands of homeowners have come forward since. The matter also garnered the attention of state lawmakers. The state Senate took up a bill that would have created an assistance fund to help affected homeowners, but it made it no further than a committee. A study determined that a mineral called pyrrhotite in the concrete causes foundations to crack and crumble years after being poured and a bill in the state House of Representatives would have required concrete companies to test for pyrrhotite. That bill never made it to a vote on the house floor. Several homeowners are suing around two dozen insurance companies because they were told the damage won’t be covered unless their homes collapse. Homeowners said they’re getting frustrated because they’re not getting much help from the state and hope the federal government can assist them. They also want answers about who knew about the problem and why nothing was done. The last statement from the attorney for JJ Mottes is that the company is now out of business. “In the 15 years since we took over the management of the Joseph J. Mottes Company, we have adhered to rigorous standards set forth by the American Concrete Institute and the state of Connecticut. We continue to cooperate with the ongoing state investigation so that homeowners can get the answers and real solutions they deserve. One thing that is clear to us is the extensive media and governmental scrutiny has led to another issue arising – in addition to homes affected by damage, there are now large numbers of homeowners and potential home buyers who do not have problems but are being told they will. “Certainly, those homes with damage need to be remedied, but a comprehensive solution is called for - one that helps those who are not financially capable of helping themselves, guards against predators of all kinds and eases the burden placed on the real estate market. We believe that effective lower cost preventive remedial actions exist, that appropriate independent authorities can and should identify these techniques, and this information needs to be widely shared and adopted.” – John Patton, spokesman, The Joseph J. Mottes Company.